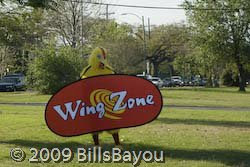 She's always friendly, our "Wing Zone" Girl. She always has a smile for us as we drive by. Oh, sure, we can't see her face in there, but everything about her says "Hello! Come and eat!" She must be smiling in that costume. You can tell. Her exuberance shines like a beacon at the end of a long day. "Buy our wings!" Her waves to her honking fans never seem to cease. Each of us in turn is a new friend. I'm betting she has a degree in history from one of the local universities. She's probably working her way through a master's program. The time spent on the expansive median on Claiborne Avenue is more likely spent wondering how the hell she's going to explain to her study group that she couldn't finish her share of the project because her mascot costume left her smelling like an old sock worn by someone with a garlic fetish. Sure, she's waving and bouncing, but inside there, where passers-by cannot hear her, she's screaming at the unfulfilled promises of life and the realization that she just may have peaked.